Product information "EasyLead R Smooth Flashing"
Smooth, aluminium-based alternative to traditional lead flashing. 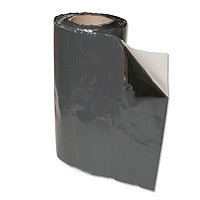 High performance, self-adhesive, 5m long roll for use in flat and pitched roof applications. Lightweight with excellent malleability. Typical application includes: Chimneys and Abutments, Saddles, Soakers and Stepped Flashing, Windows, Dormers and Rooflights, Valleys and Gutters. EasyLead R is rolled sheet aluminium with a protective anti-corrosion coating and a high performance butyl adhesive on the underside. EasyLead is easily installed and can be worked in any direction using a mallet, roller or by hand. Cutting is easy too using a knife or scissors. Related links to "EasyLead R Smooth Flashing"
Customer review for "EasyLead R Smooth Flashing"